Arthur Ashkin invented optical tweezers that grab particles, atoms and molecules with their laser beam fingers. Viruses, bacteria and other living cells can be held too, and examined and manipulated without being damaged. Ashkin’s optical tweezers have created entirely new opportunities for observing and controlling the machinery of life. Arthur Ashkin had a dream: imagine if beams of light could be put to work and made to move objects. In the cult series that started in the mid-1960s, Star Trek, a tractor beam can be used to retrieve objects, even asteroids in space, without touching them. Of course, this sounds like pure science fic- tion. We can feel that sunbeams carry energy – we get hot in the sun – although the pressure from the beam is too small for us to feel even a tiny prod. But could its force be enough to push extremely tiny particles and atoms? Immediately after the invention of the first laser in 1960, Ashkin began to experiment with the new instrument at Bell Laboratories outside New York. In a laser, light waves move coherently, unlike ordinary white light in which the beams are mixed in all the colours of the rainbow and scattered in every direction. Ashkin realised that a laser would be the perfect tool for getting beams of light to move small particles. He illuminated micrometre-sized transparent spheres and, sure enough, he immediately got the spheres to move. At the same time, Ashkin was surprised by how the spheres were drawn towards the middle of the beam, where it was most intense. The explanation is that however sharp a laser beam is, its intensity declines from the centre out towards the sides. Therefore, the radiation pressure that the laser light exerts on the particles also varies, pressing them towards the middle of the beam, which holds the particles at its centre. To also hold the particles in the direction of the beam, Ashkin added a strong lens to focus the laser light. The particles were then drawn towards the point that had the greatest light intensity. A light trap was born; it came to be known as optical tweezers. Figure 1. 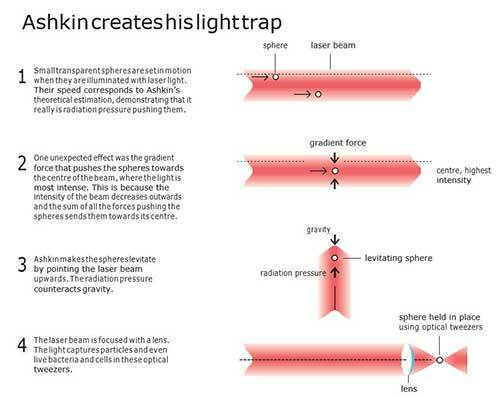 Ashkin creates a light trap, which becomes known as optical tweezers. After several years and many setbacks, individual atoms could also be caught in the trap. There were many difficulties: one was that stronger forces were needed for the optical tweezers to be able to grab the atoms, and another was the heat vibrations of the atoms. It was necessary to find a way of slowing down the atoms and packing them into an area smaller than the full-stop at the end of this sentence. Everything fell into place in 1986, when optical tweezers could be combined with other methods for stopping atoms and trapping them. While slowing down atoms became an area of research in itself, Arthur Ashkin discovered an entirely new use for his optical tweezers – studies of biological systems. It was chance that led him there. In his attempts to capture ever smaller particles, he used samples of small mosaic viruses. After he happened to leave them open overnight, the samples were full of large particles that moved hither and thither. Using a microscope, he discovered these particles were bacteria that were not just swimming around freely – when they came close to the laser beam, they were caught in the light trap. Howe- ver, his green laser beam killed the bacteria, so a weaker beam was necessary for them to survive. In invisible infrared light the bacteria stayed unharmed and were able to reproduce in the trap. Accordingly, Ashkin’s studies then focused on numerous different bacteria, viruses and living cells. He even demonstrated that it was possible to reach into the cells without destroying the cell membrane. Ashkin opened up a whole world of new applications with his optical tweezers. One important breakthrough was the ability to investigate the mechanical properties of molecular motors, large molecules that perform vital work inside cells. The first one to be mapped in detail using optical tweezers was a motor protein, kinesin, and its stepwise movement along microtubules, which are part of the cell’s skeleton. Figure 2. The optical tweezers map the molecular motor kinesin as it walks along the cell skeleton. Over the last few years, many other researchers have been inspired to adopt Ashkin’s methods and further refine them. The development of innumerable applications is now driven by optical tweezers that make it possible to observe, turn, cut, push and pull – without touching the objects being investigated. In many laboratories, laser tweezers are therefore standard equipment for studying biological processes, such as individual proteins, molecular motors, DNA or the inner life of cells. Optical holography is among the most recent developments, in which thousands of tweezers can be used simultaneously, for example to separate healthy blood cells from infected ones, something that could be broadly applied in combatting malaria. Arthur Ashkin never ceases to be amazed over the development of his optical tweezers, a science fiction that is now our reality. The second part of this year’s prize – the invention of ultrashort and super-strong laser pulses – also once belonged to researchers’ unrealised visions of the future. The inspiration came from a popular science article that described radar and its long radio waves. However, transferring this idea to the shorter optical light waves was difficult, both in theory and in practice. The breakthrough was described in the article that was published in December 1985 and was Donna Strickland’s first scientific publication. She had moved from Canada to the University of Rochester in the US, where she became attracted to laser physics by the green and red beams that lit the laboratory like a Christmas tree and, not least, by the visions of her supervisor, Gérard Mourou. One of these has now been realised – the idea of amplifying short laser pulses to unprecedented levels. Laser light is created through a chain reaction in which the particles of light, photons, generate even more photons. These can be emitted in pulses. Ever since lasers were invented, almost 60 years ago, researchers have endeavoured to create more intense pulses. However, by the mid-1980s, the end of the road had been reached. For short pulses it was no longer practically possible to increase the intensity of the light without destroying the amplifying material. Figure 3. The CPA technique revolutionised laser technology. It enabled the emission of ver y intense, short pulses of light using an intricate method to avoid the risk of destroying the amplifying material. Instead of amplifying the light pulse directly, it is first stretched in time, reducing its peak power. Then the pulse is amplified and when it is compressed more light is collected in the same place – the light pulse becomes extremely intense. Strickland and Mourou’s new technique, known as chirped pulse amplification, CPA, was both simple and elegant. Take a short laser pulse, stretch it in time, amplify it and squeeze it together again. Whena pulse is stretched in time, its peak power is much lower so it can be hugely amplified without damaging the amplifier. The pulse is then compressed in time, which means that more light is packed together within a tiny area of space – and the intensity of the pulse then increases dramatically. It took a few years for Strickland and Mourou to combine everything successfully. As usual, a wealth of both practical and conceptual details caused difficulties. For example, the pulse was to be stretched using a newly acquired 2.5 km-long fibre optic cable. But no light came out – the cable had broken somewhere in the middle. After a great deal of trouble, 1.4 km had to be enough. One major challenge was synchronising the various stages in the equipment, getting the beam stretcher to match the compressor. This was also solved and, in 1985, Strickland and Mourou were able to prove for the first time that their elegant vision also worked in practice. The CPA-technique invented by Strickland and Mourou revolutionised laser physics. It became standard for all later high-intensity lasers and a gateway to entirely new areas and applications in physics, chemistry and medicine. The shortest and most intense laser pulses ever could now be created in the laboratory. How are these ultrashort and intense pulses used? One early area of use was the rapid illumination of what happens between molecules and atoms in the constantly changing microworld. Things happen quickly, so quickly that for a long time it was only possible to describe the before and after. But with pulses as short as a femtosecond, one million of a billionth of a second, it is possible to see events that previously appeared to be instantaneous. A laser’s extremely high intensity also makes its light a tool for changing the properties of matter: electrical insulators can be converted to conductors, and ultra-sharp laser beams make it possible to cut or drill holes in various materials extremely precisely – even in living matter. For example, lasers can be used to create more efficient data storage, as the storage is not only built on the surface of the material, but also in tiny holes drilled deep into the storage medium. The technology is also used to manufacture surgical stents, micrometre- sized cylinders of stretched metal that widen and reinforce blood vessels, the urinary tract and other passageways inside the body. There are innumerable areas of use, which have not yet been fully explored. Every step forward allows researchers to gain insights into new worlds, changing both basic research and practical applications. Figure 4. 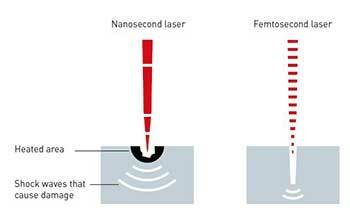 The short pulses from a femtosecond laser (right) cause less damage in the material than the million-times longer pulses from a nanosecond laser (left). Ultrashort and intense laser pulses are used in eye surgery, data storage and the manufacture of medical stents for operations in the body’s vessels. One of the new areas of research that has arisen in recent years is attosecond physics. Laser pulses shorter than a hundred attoseconds (one attosecond is a billionth of a billionth of a second) reveal the dramatic world of electrons. Electrons are the workhorses of chemistry; they are responsible for the optical and electrical properties of all matter and for chemical bonds. Now they are not only observable, but they can also be controlled. Figure 5. The faster the light pulses, the faster the movements that can be observed. The almost inconceivably short laser pulses are as fast as a few femtoseconds and can even be a thousand times faster, attoseconds. This allows sequences of events, which could once only be guessed at, to be filmed; the movement of electrons around an atomic nucleus can now be observed with an attosecond camera. Many applications for these new laser techniques are waiting just around the corner – faster electronics, more effective solar cells, better catalysts, more powerful accelerators, new sources of energy, or designer pharmaceuticals. No wonder there is tough competition in laser physics. Donna Strickland is now continuing her research career in Canada, while Gérard Mourou, who has returned to France, is involved in a pan-European initiative in laser technology, among other projects. He initiated and led the early development of Extreme Light Infrastructure (ELI). Three sites – in the Czech Republic, Hungary and Romania – will be complete in a few years’ time. The planned peak power is 10 petawatts, which is equivalent to an incredibly short flash from a hundred thousand billion light bulbs. These sites will specialise in different areas – attosecond research in Hungary, nuclear physics in Romania and high energy particle beams in the Czech Republic. New and even more powerful facilities are being planned in China, Japan, the US and Russia. There is already speculation about the next step: a tenfold increase in power, to 100 petawatts. Visions for the future of laser technology do not stop there. Why not the power of a zettawatt (one million petawatts, 1021 watt), or pulses down to zeptoseconds, which are equivalent to the almost inconceivably tiny sliver of time of 10 –21 seconds? New horizons are opening up, from studies of quantum physics in a vacuum to the production of intense proton beams that can be used to eradi- cate cancer cells in the body. However, even now these celebrated inventions allow us to rummage around in the microworld in the best spirit of Alfred Nobel – for the greatest benefit to humankind. Figure 6. The development of the highest intensity laser pulse. 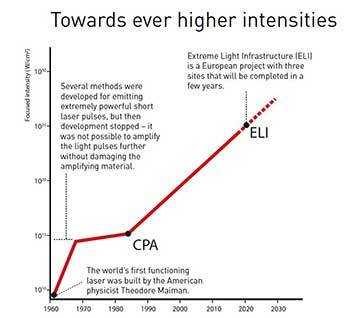 The CPA technique being rewarded this year is the foundation for the explosive development of increasingly strong laser pulses. 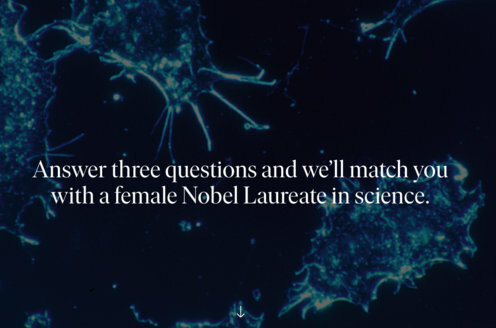 Additional information on this year’s prizes, including a scientific background in English, is available on the website of the Royal Swedish Academy of Sciences, www.kva.se, and at http://www.nobelprize.org. There you can watch video footage of the press conferences, the Nobel Lectures and more. Information on exhibitions and activities related to the Nobel Prizes and the Prize in Economic Sciences is available at www.nobelcenter.se. Born 1922 in New York, USA. Ph.D. 1952 from Cornell University, Ithaca, USA. Born 1944 in Albertville, France. Ph.D. 1973. Born 1959 in Guelph, Canada. Ph.D. 1989 from University of Rochester, USA.